Alan Goehring was born in Milwaukee, Wisconsin, on February 21, 1962 and now lives in Henderson, Nevada. He turned to playing poker after retiring from his high-octane job as a junk bond analyst and trader. Alan Goehring became a professional poker player at the age of 37. 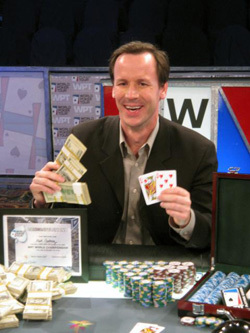 Alan Goehring’s first big win came before he decided to become a professional poker player, when he finished third place in the $3,000 No Limit Holdem event of the 1997 World Series of Poker and received a $61,845 payday. Unfortunately, he has had difficulties in heads-up play, earning him a reputation of not being able to win the #1 spot in major tournaments. He placed second in the 1999 World Series of Poker Main Event to earn $768,625. Noel Furlong beat him in the Main Event to deprive him of a spot on the Wall of Fame. He followed up this second place finish with several more close calls, thus solidifying his reputation. Alan Goehring finally threw off the curse that had been haunting him when he won the 2003 $25,000 World Poker Tour Championship Season 1, defeating Kirill Gerasimov of Russia in heads-up play to take home $1,011,886. His victory was even more impressive when you look at the other names that made the final table, names such as Ted Forrest, Phil Ivey, and the legendary Doyle Brunson. Since then, Alan Goehring has made several more WPT final tables. His largest win was in 2006 in the LA Poker Classic/ WPT season 4 at the Commerce Casino, where he bagged a whopping $2,391,550 first place prize. Goehring proclaims himself a “poker hobbyist” and not a professional, though his over $5 million in tournaments earnings say otherwise. He says he is in the game for fun not money. At the poker tables, he can frequently be seen wearing extremely large, dark sunglasses.